They can erect giant metal statues in your likeness, paint elaborate portraits, and maybe even make a movie about your life. But when they make a life-size chocolate bust of you, that’s when you know you really did something important with your time on this earth. Or off of it, in the case of Star Trek’s Scotty. Few of us will ever have the opportunity to create something as wonderful—and completely edible—as this chocolate effigy of the USS Enterprise’s most memorable engineer. But what better way could there be to be remembered after you pass? Being shot out of a spaceship in a torpedo? That’s been done. 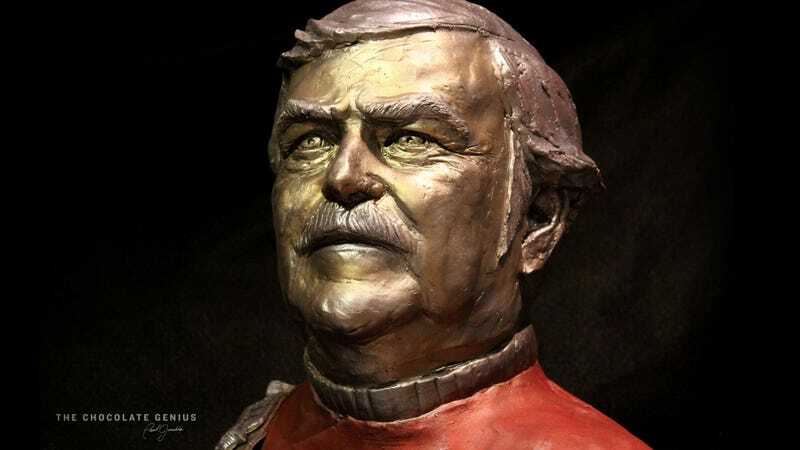 The chocolate Scotty (who was played by actor James Doohan) was created by a confectioner humbly known as The Chocolate Genius who has apparently immortalized countless other famous figures in sweet treats. But Scotty just might be his masterpiece. So forget the chocolate bunnies when Easter rolls around again next year. Let’s hope we find foil-wrapped Starfleet members for sale to give us that sugar high.